Time and expense tracking with HR tools help your clients run their business better. 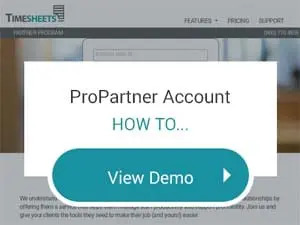 Join the Timesheets.com ProPartner Program and get them started. We understand that your clients are your lifeblood and we want to help you nurture those relationships by offering them a service that helps them support profitability and manage staff productivity. Join us and give your clients the tools they need to make their job (and yours!) easier. We make it easy for you to refer clients. We handle your client's evaluation with attention and respect. Late or incomplete timesheets – Late timesheets waste everyone's time. Tracking hours in real-time eliminates unwelcome surprises right before payroll or billing. Uncertain employee location - Doubts arise when clients can't see their employees. With location tracking, clients will know their staff is on site when they're on the clock. Careless expense reporting - Expenses can be a bookkeeping nightmare. Timesheets.com provides real-time recording and receipt upload. Time off discrepancies - Disgruntled employees put your clients at risk. Employers appreciate our user-friendly PTO request and approval process. Compliance risks - Sloppy recordkeeping is a ticking timebomb. Timesheets.com protects your clients with an extensive audit trail and comprehensive reporting features. Client success starts here. Become a ProPartner.